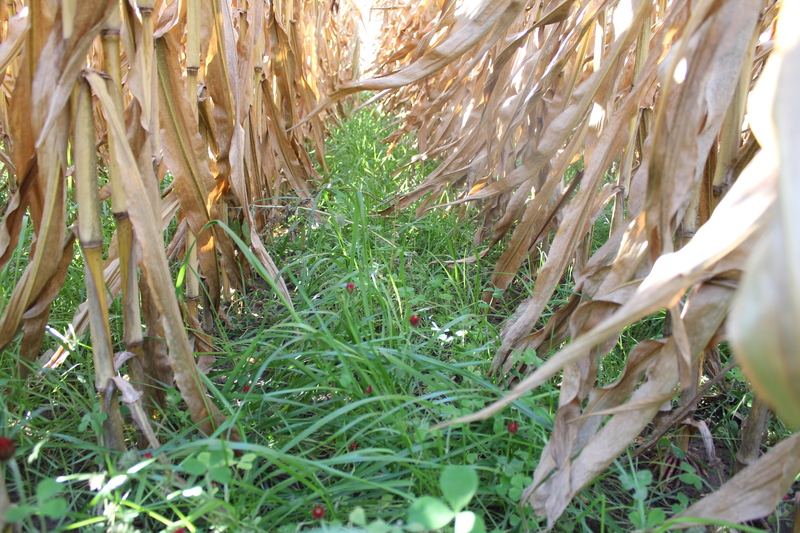 There is interest in inter-seeding annual ryegrass and clover into corn (Figure 1). 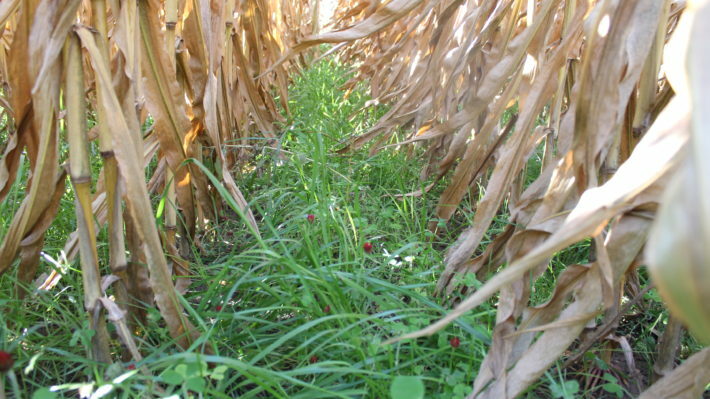 Research studies have been done in the United States and Canada to determine the tolerance of cover crops to various soil applied corn herbicides. This article provides an overview of the results of that work, and provides some consensus across the different locations. 2) How long the herbicide persists in the soil. Herbicides with shorter half-lives (the time it takes for 50% of the active ingredient to dissipate) offer less risk of injury to rotational crops, or in this case, an inter-seeded cover crop. Several factors will influence the rate of dissipation such as rainfall, soil texture and soil pH. In general, products with a 4 month or less rotation restriction for the cover crops of interest should pose little risk to establishment. These products typically have half-lives of less than 30 days. The following tables provide an estimation of the range of injury levels, as well as consensus on the potential for carryover of some commonly pre-emergence corn herbicides to injure inter-seeded annual ryegrass and clover (crimson and red). Table 1. Annual rye-grass sensitivity to soil applied corn herbicides. Armezon + atrazine Low BASF internal trials. Banvel II or Marksman Low BASF internal trials. (20 ac/case rate) Low Little to no injury observed in trials conducted in Ontario by Dr. Darren Robinson and in Quebec by Dr. Gilles Leroux. Engarde Low Little to no injury observed in trials conducted in Ontario by Dr. Darren Robinson. (292 mL/ac) Low Little to no injury observed in trials conducted in Ontario by Dr. Darren Robinson and in Quebec by Dr. Gilles Leroux. Callisto Moderate Injury and stand reduction observed in trials conducted in Ontario by Dr. Darren Robinson. Prowl H2O Moderate Injury and stand reduction observed in trials conducted in Ontario by Dr. Darren Robinson. Dual II Magnum High Over 90% reduction in stand observed in a 2015 OMAFRA trial. A Michigan study by Tharp and Kells, 2000 observed a 96% stand reduction with metolachlor, the active ingredient in Dual II Magnum. Focus High Significant stand reductions observed in trials conducted in Ontario by Dr. Darren Robinson. Lumax EZ High Significant stand reductions observed in trials conducted in Ontario by Dr. Darren Robinson. Table 2. Clover species sensitivity to soil applied corn herbicides. (292 mL/ac) Low Little to no injury to red clover observed in trials conducted in Ontario by Dr. Darren Robinson and on crimson clover in Quebec by Dr. Gilles Leroux. Focus Low Little to no injury to red clover observed in trials conducted in Ontario by Dr. Darren Robinson. (20 ac/case rate) Moderate Significant stand reductions of red clover observed in trials conducted in Ontario by Dr. Darren Robinson. Studies conducted in Quebec by Dr. Gilles Leroux found variable tolerance with crimson clover being more tolerant then red clover and less injury with both at the lowest rate of Converge XT. Prowl H2O Moderate Slight injury and stand reduction observed in trials conducted in Ontario by Dr. Darren Robinson. A Michigan study by Tharp and Kells, 2000 observed a 15% stand reduction in crimson clover. Callisto High Significant stand reductions to red clover observed in trials conducted in Ontario by Dr. Darren Robinson. Dual II Magnum High Over 40% reduction in stand of crimson clover observed in a 2015 OMAFRA trial. A Michigan study by Tharp and Kells, 2000 observed a 45% stand reduction in crimson clover with metolachlor, the active ingredient in Dual II Magnum. 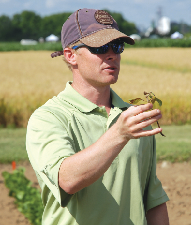 Engarde High Significant stand reductions to red clover observed in trials conducted in Ontario by Dr. Darren Robinson. Lumax EZ High Significant stand reductions to red clover observed in trials conducted in Ontario by Dr. Darren Robinson. Observations from any Ontario and Quebec research: Crimson clover appears to be more tolerant to herbicides than red clover. Crimson clover is also more shade tolerant and likely a better candidate for inter-seeding into corn. Tharp, B.E. and J.J. Kells. 2000. Effect of Soil-Applied Herbicides on Establishment of Cover Crop Species. Weed Technology. 14:596-601.